ITSP Wins BAFTA for "Best Debut Game"
It's always a pleasure to get fan mail. A couple of weeks ago, we received an email that really put a big smile on my face. I asked Jamie, the author of the email, if it would be okay to share it with our readers and I was enthusiastically given permission. Here it is! My daughter, Milla Beene, she's 5 years old, loves your game. She finds it delightfully scary and is always getting us to play it. She really loves the art of the game and I guess the cute little spaceship, fighting against the odds. Anyway, she drew a whole heap of pictures in honour of the game (this is what is attached). 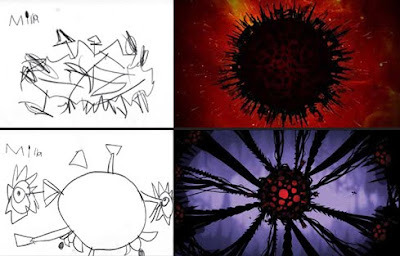 I tried to find some comparison screen shots so you have some idea of what she was drawing. 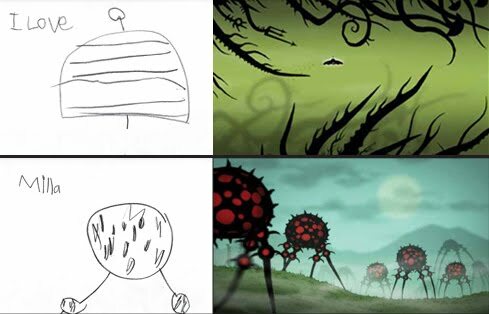 She calls the eyeball monster at the end of the demo the 'mummy' monster and absolutely loves the spider stalking creatures. So thanks for making a game that delights a little kid so much that she feels the need to replicate the art. Looking forward to see what you come up with next. Congrats on all your success. Any chance that ITSP will come over to playstation? please?